Did I really complain about doing all those UT tower shots? Today I got a notice from the University of Texas Office of the Chancellor that the chancellor himself, Mark Yudof, wants to order a copy of my version of the national championship tower poster. He picked mine. 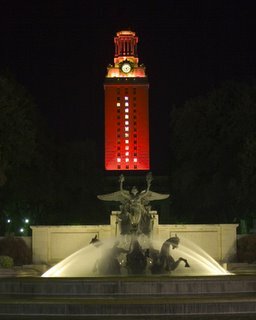 Of all the freaking amazing photographers in this town, including officials ones for UT itself, he picked mine. I have, oddly, sold about 10 times the number of these prints than I expected. I am in my third reprint. So I think, right here, right now, I officially quit whining about getting up at four in the morning for a clean shot, working a 70-hour week to get pictures out, and worrying about sales. This is way too exciting!!!!! Does this mean I am a “real” photog now? Unbelievable! This post is probably going to subject me to more ridicule than yesterday’s cheesy Statesman letter (“photo gives us hope…”good gracious…) But I press on anyway. I accidentally became a slacker mom Monday. I am in charge of snacks for Elizabeth’s preschool class this week, and when I got home yesterday from picking her up, the teacher had surreptitiously slid me a note among Eliza’s feather collages and finger paintings reminding me of my error. This morning I practically careened to the grocery store to pick up finger foods and get them to her class even though she does not attend on Tuesdays. Back when I signed up for snack time, I had visions of cute hand-made food toys. Now I had to rush just to get something for the kiddos to shove down their gullets. I remembered a few years ago making a candy train. The base was a pack of gum, the engine compartment involved two “Now and Later” candies, and a kiss made a smoke stack with the little paper curling up. The wheels were circles of peppermint. 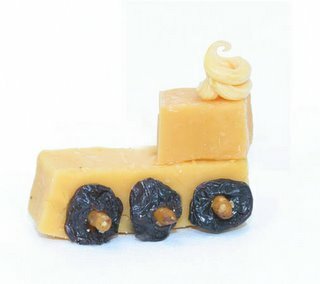 I was not allowed to use sweets for the snack, so I dashed about the grocery store, trying to come up with the components of the choo choo without involving allergy foods like peanut butter and anything sugary. As I stocked up on blocks of cheese and pretzel sticks and wheel-shaped dried cherries, I wondered how I would hold the concoction together. The pretzel sticks might break the cheese apart, and I could not fall back on the mainstays of peanut butter or frosting as edible glue. Then, beckoning at the end of the aisle, glittered the shiny white rows of Easy Cheese. I held up a can, compared artificial flavors. I avoided looking at sodium or fat. Or ingredients. It’s sticky. It’s squeezable. It would work. In middle school I had an addiction to Easy Cheese. Not so bad I would squirt it directly in my mouth, but I could pile it so high on a single cracker that the threat of it toppling was well assured. I didn’t have much access to it, as my parents wouldn’t buy it. But if I went to a party (I come from a long line of gatherings involving Ritz crackers and Easy Cheese) I never strayed far from the siren call of a long lovely flow of yellow cheese product. My Easy Cheese obsession was abruptly halted at a party in my early 20s. Some friends hosted a Halloween gathering in their double-wide trailer and served, naturally, my favorite pressurized snack. I was sitting at the bar when a drunk guy grabbed the can, pushed the nozzle, and fed the family’s dog a hard dose of Easy Cheese. The dog licked the nozzle and whined for more. The man laughed and set the can back on the counter with the food. My stomach heaved. I snagged the can along with the others and dumped them into the trash, washing the dog slobber off my hands afterward. I imagine dogs licking it, people licking it. I couldn’t take it anymore. Never again. I spent a good half hour working with pretzels and cheese and cherries to get it to work. I did not have to use the Easy Cheese. I could even, I thought, throw it out without breaking the seal. But something was missing. Smoke. I imagined the little curl of yellow spreading upward from the cheese cube engine. I couldn’t resist. I popped the top and pressed my finger on the slender white nozzle. It sputtered at first, showering a splatter of yellow on the counter. Still strong, I wiped it with a sponge. I shaped a little twist of smoke, but it fell off the side. Without thinking, I cleared it off the train with my finger. Oh, a finger full of Easy Cheese. What to do? I eyed the sink, the faucet could wash away my temptation. But no girl with my history could resist for long. I licked the finger, the salty sharp cheese flavor flooding my senses. And I, sadly, was lost. We’ll see if the can makes it to the end of the day. It’s hidden, but I know exactly where to find it. I love UT. I got my degree there. I was in Longhorn Band. I wrote for the Daily Texan. I had school spirit, for Pete’s sake. But after spending every evening at the tower for three days straight, I’m tired. The first few nights at the tower were frenetic. 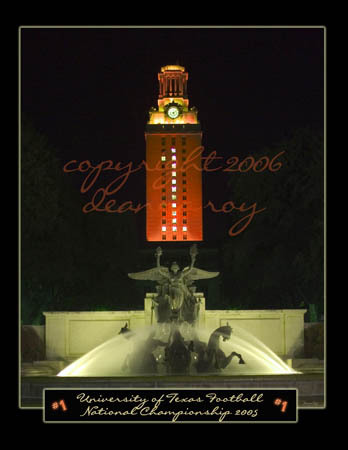 The energy crazy, the fans erupting in “Texas” and “Fight.” I would guess about 300 people stood in front of the Littlefield “flying horse” fountain at any given moment between dusk and midnight or so. The entire South Mall was a mob of people jostling for position. I photographed 13 scheduled families, plus three more that just showed up, plus two more sets of friends who found me, plus three more “pick up” shoots of strangers who wanted a professional shot and asked me if I’d do one. I am exhausted. The big orange tower looms behind my eyelids even in sleep. The girls and I took our picture the first night of my shoot. 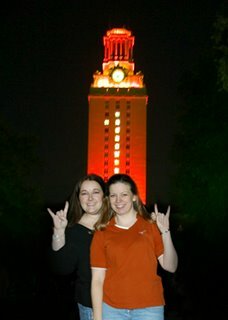 My friend Lanette assisted, and a very tired me is pictured with her in front of the tower. Last night, or early I guess, this morning, I launched out of bed at 4 a.m. and drove over to the tower in hopes of getting a clear shot without a billion bystanders. About 20 people still staked out their spot in front of the fountain, but I elbowed my way through that paltry crowd and got my shot. I also drove around to the Fine Arts circle and shot it there, but the fountain was not lit, so it did not inspire me. This last night of the tower lighting was morose. The laughing and cheering of nights past were tempered by Vince Young’s announcement that he was entering the draft. The smiles were half hearted. He was mentioned frequently, with a begrudging, “Well, he should take the opportunity.” Everyone seemed to think he’d shafted the Horns. Sold out. I don’t worry about these things, just rearranged families in various positions and snapped wildly. Supposedly the tower will be lit once more when the students return to class. I could rush my portfolios out to my clients and attach a note that I will do “one more” run of 20-minute sessions throughout the final night. It’s a lot of money; a good opportunity. 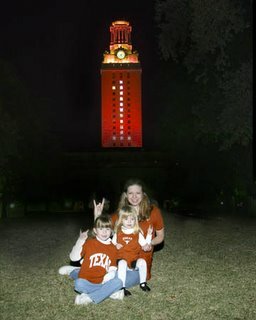 But no matter how much I love my Longhorns, I don’t think I could say, “Hook ‘Em” even one more time. My dedication is done until I get some sleep. After each trick or treat session, each member of the party announces the treat they received. 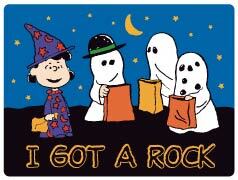 Each time, with great dejection, Charlie Brown says, “I got a rock.” Every year the show airs, concerned children flood any fan club for Charlie Brown they can find with candy. We’re a sympathetic lot. I waited at the house with great anticipation for my daughters to return from their grandparents’ house this Christmas Eve. Emily jumped out of the car, tote bag in hand, immediately pulling out favorite new toys, a shirt, candy, and coloring books. “Look what I got for Christmas!” she said, spreading her loot all over the stairs. She held out her hand and opened her fist. 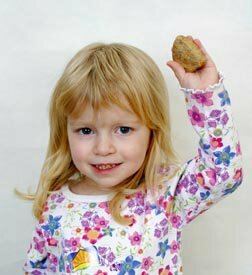 “I got a rock!” she announced. 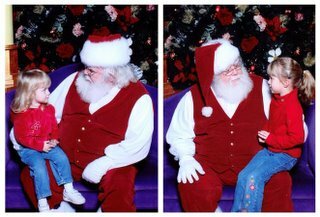 Children are always the unexpected joy at Christmas. You can spend entire paychecks on toys, games, puzzles or treats, but you can never anticipate the thing that matters most to them–an empty box the perfect size to sit inside, a colorful bow that fascinates them for hours, or, as in the case of little ‘Liza, a rock she found in the dirt at her grandparent’s lake house. I wish all of you a wonderful holiday filled with simple joys discovered in unexpected places. Merry Christmas. It took four days to recover the rest of my life sufficiently to even think of NaNoWriMo again, but I didn’t want to leave anyone hanging! I reached 50,000 words at about 8 p.m. on Nov. 30. To cross the big mark, I wrote a live “interactive” scene where a bunch of patients at St. Martins Hospital play Truth or Dare. To get ideas for the scene we actually played Truth or Dare at the coffee shop, and I took down everything that we did and said. All my NaNo pals now have cameos. I’ll put that scene up here once I clean it up. This will hopefully be today, as I would like to read the scene as part of the party tonight. Several will be reading excerpts. I am also going dressed as Helena, in polka dot pajamas. I will keep this blog active. A group of NaNos have decided to form a writing group of our own, so I will be working on Helena the Muse via it. I am entering contests in January and March with it, so I will be finalizing the first chapter and hopefully getting through a complete rough draft to make sure my synopsis is accurate. I am not totally certain how it will end, even though I have mapped out how I think it will go. I am not completely sure how Helena will change/grow as a result of her experiences. She has to just keep experiencing! Thank for coming along for the ride!